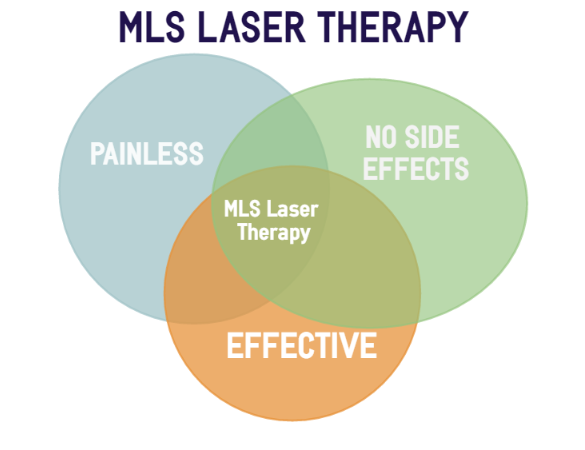 The MLS laser is a great treatment for those suffering with tendonitis, heel pain, neuropathy, and chronic pain. The laser is a great option because it is painless and does not have any side effects. We have been using the laser for our patients with great results. 1. Anti Inflammatory: MLS Laser Therapy has an anti-edema effect as it causes vasodilation, but also because it activates the lymphatic drainage system which drains swollen areas. As a result, there is a reduction in swelling caused by bruising or inflammation. 2. Analgesic: MLS Laser Therapy has beneficial effect on nerve cells. It blocks pain transmitted by these cells to the brain which decreases nerve sensitivity. Also, due to the decreased inflammation, there is less edema and less pain. Another pain blocking mechanism involves the production of high levels of pain killing chemicals such as endorphins and enkephalin from the brain and adrenal gland. 4. Improved Vascular Activity: Laser light will significantly increase the formation of new caplillaries in damaged tissue which speeds up the healing process, closes wounds quickly and reduces scar tissue. Additional benefits include acceleration of angiogenesis, which causes temporary vasodilation and increase in the diameter of blood vessels. 7. Reduced Fibrous Tissue Formation: Reduces the formation of scar tissue following tissue damage from cuts, scratches, burns or surgery. 8. Improved Nerve Function; Slow recovery of nerve functions in a damaged tissue can result in numbness and impaired limbs. Laser light speeds the process of nerve cell reconnection. 9. Faster Wound Healing: Laser light stimulates fibroblast development in damaged tissue. These are the building blocks of collagen, which is the essential protein required to replace old tissue or to repair tissue.